We are only weeks away from fall and even though I love the summer that we had, I’m so excited about fall. In Ontario, we have the most spectacularly beautiful falls! I love the weather, the smells, the leaves changing colours and dressing up in warm cozy sweaters and throws. Could I stress it any more? I LOVE FALL! One of my favourite things about fall is decorating my front porch area and bringing autumn inside. 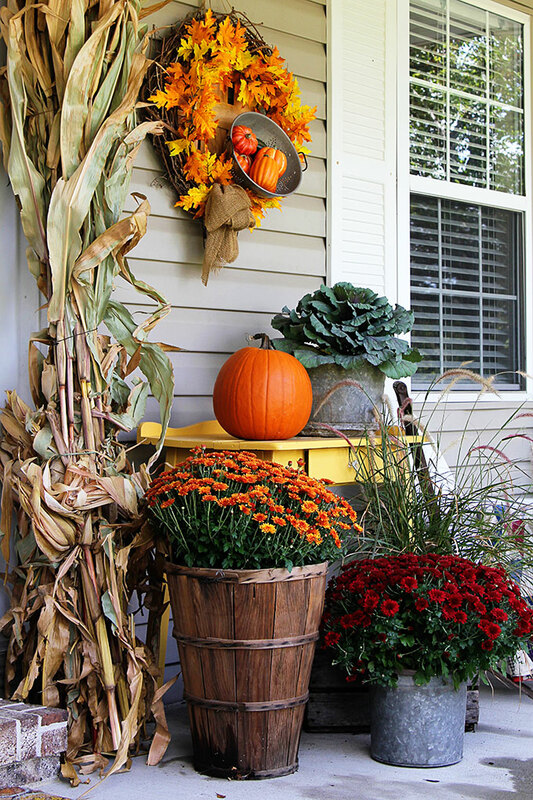 Today, I am excited to share my 6 favorite fall front door decor ideas. I’m sure you’ll find a few that you’ll love to try to recreate this year. An easy way to begin decorating your front porch is by adding a variety of pumpkins and ghourds. I love collecting different sized pumpkins in combinations of odd numbers: 3, 5 or 7. As much as I love orange colored pumpkins, in recent years I’ve gone crazy for white ones. Especially, I love adding some writing on the white pumpkins. I’ll definitely be adding the letter “V” this year to make my own monogram pumpkin. So cute but stylish too! 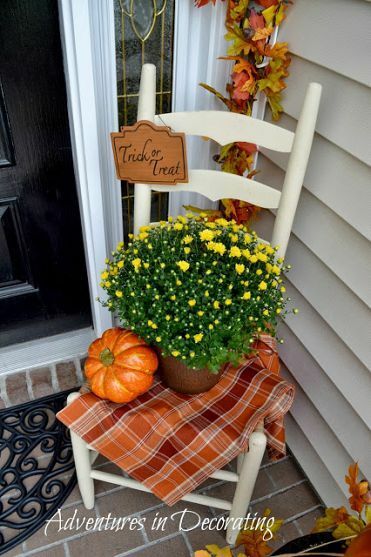 Next, an important element to add to your front porch decor is a variety of greenery that is associated with fall. Of course, the popular choice is mums. I love adding mums. Each year I’ll pick one color choice and add a variety on my porch. But, keep in mind that there are other choices as well such as: corn stalks, bales of hay, kale, different types of grasses and branches, or potted little peppers. Try to add 2-3 choices to add a dynamic look to your front porch. These can be displayed in individual containers across the porch or together in one or two containers or pots. Also, when decorating my porch for fall, I try to add some whimsy by using unexpected types of containers. Of course, you can add whatever planters you currently have. But why not try different boxes and crates, a wheelbarrow, tin containers, a rubber boot? Use your imagination! Check out some local garage sales or thrift shops and pick up unique container choices. I like adding used or vintage looking items to create an interesting look and move away from a store-bought look. For instance, last year I incorporated a metal firewood container that I no longer use inside. Of course, as the days get shorter, an important element to add to your front door decor is a lantern. Include a variety of looks, shapes and sizes. Again, display your lanterns in odd numbers. Once you get the basic elements in place you’ll then want to think about how you can add an unexpected touch to your fall front door decor. How are you going to add your personality? How will you make your house stand apart in the neighborhood? So, one way is by adding a piece of furniture like a bench, a rocking chair or some kind of table. Bring something from inside to your front porch. I also like to add other pieces like a ladder or a screen or an old vintage window pane. As well, I love to add some kind of signage to my fall front door decor. Find a great quote about fall and add it to some wood or make a chalkboard sign. You can simply check out Pinterest for creative ways to add wording to your decor. Here are some of my favorite. 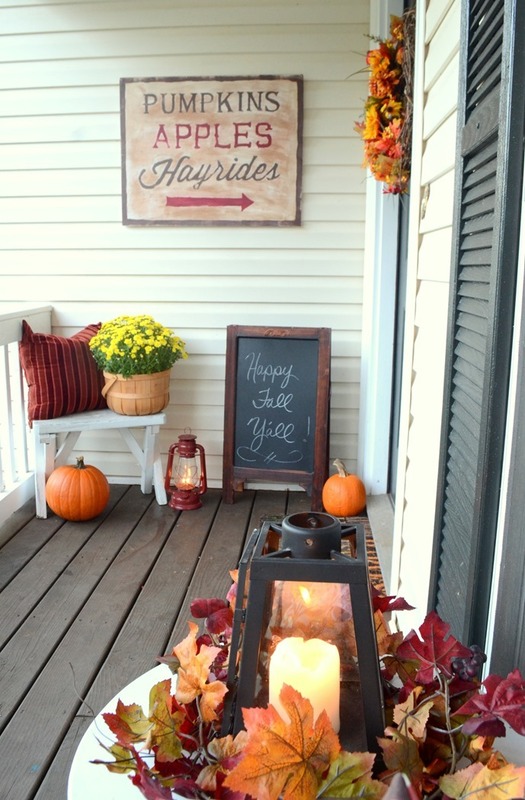 Get your DIY on and try to create your own unique sign to welcome your guests to your home this season! Finally, I would also consider adding a fresh door mat for the fall season and even a wreath for your door. It’s still super hot here so I’m not yet putting my fall decor in place. 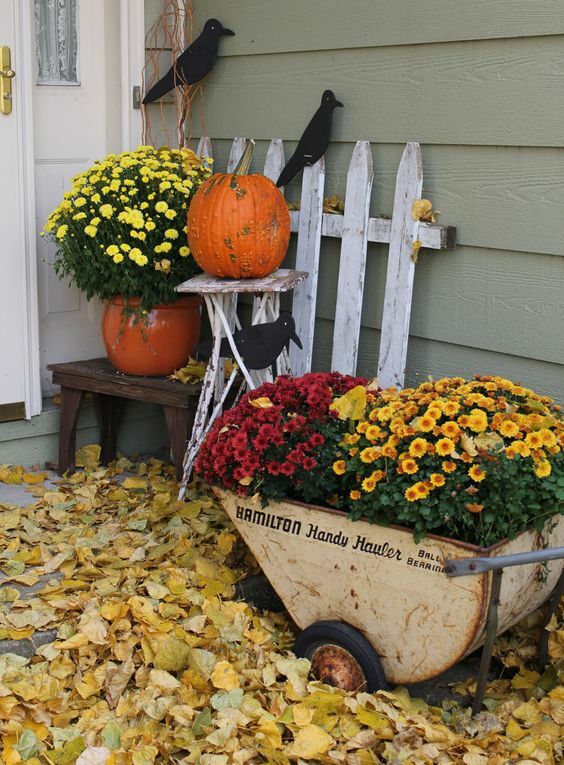 But I am definitely collecting and can’t wait to transform my front porch for fall. Then, when Halloween comes around, I will add a few other touches to getting into a more spooky mood in time for the trick or treaters! 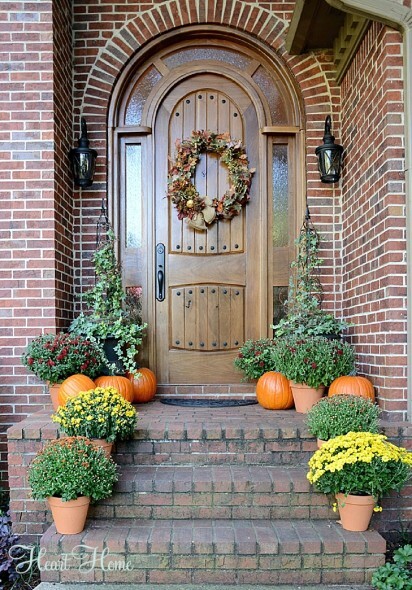 Why not reach out to me and let me know what decor tips you use to create a great front porch design for fall?